To view a shipment, go to TCode VT03N and use your shipment number. To view deliveries contained in the shipment, go to Top Menu -> GoTo -> Shipments and Deliveries and double click on a delivery you want to see (or use directly Tcode VL03N and enter the delivery number). To view handling units in the delivery, press Ctrl+F6 (or the “box” icon in the top toolbar). iv_delivery TYPE vbeln VALUE '2016280854' "Your delivery number from shipment. The above code is great if you need information about one delivery. But what if you need to get information about all HU’s in all deliveries of one shipment? 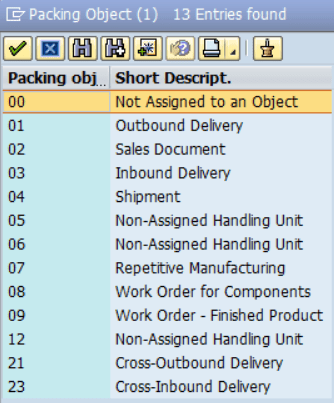 This entry was posted in ABAP, Sales & Distribution, SAP and tagged Handling unit, HU_GET_HUS by Spider. Bookmark the permalink.